FormuMax proudly offers two types of clodronate liposomes. Clophosome® with the clodronate molecules encapsulated in neutral liposomes is capable of achieving macrophage depletion of 80-90% in spleen after a single intravenous or intraperitoneal administration. 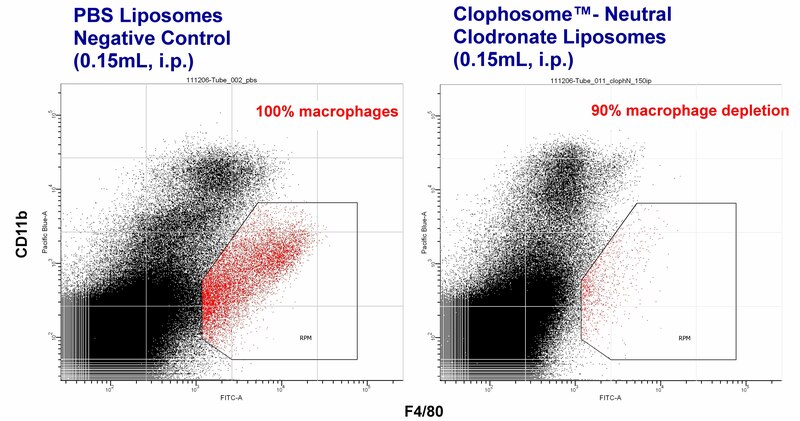 Clophosome®-A composed of anionic lipids further improve the efficacy in macrophage depletion to above 90% in spleen after a single intravenous injection. Clodronate molecules are encapsulated in small MLV liposomes for superior activity, physical and chemical stability, and convenience of use and handling. Both types of Clophsome® are offered in the standard suspension form fo rthe convenience of use, the high potency form fo rdosing of high cotent with limited small volume and the lyophilized forms for the long shelf-life. For your convenience, the products are provided in various combo kits and vial sizes (2mL and 10mL). Evaluation samples are also available upon request. See below for results and product details. We have recently added two new forms of Clophosome® products. The first being the high potency neutral Clophosome® (20mg/mL) so that high amount of Clophosome® could be dosed when the dosing volume is small, such as intratracheal, intranasal, Intracerebroventricular (ICV) or intratumor injections. We have also introduced lyophilized Clophosome® (both neutral and anionic forms) which give exceptional shelf-life of one year. The Clophosome® can be easily reconstituted to regenerate Clophosome® comparable to the original liquid Clophosome®.